There are different types of ankle sprains which involved different aspects of the ankle complex. Injuries to the ankle ligaments can vary depending on the position of the ankle during injury, the direction the body fall during injury, the type of shoegear one is wearing during injury, the activity in which the injury occurred and the force in which the injury occured. In some cases there is a combination of injuries. There are three main categories of ankle ligament injuries. Robert H. Sheinberg, D.P.M., D.A.B.P.S., F.A.C.F.A.S. The ankle is a complex joint composed of three bones, cartilage, tendons and joint lining. The ankle joint itself lets us move forward as the ankle motion is primarily up and down. While the ankle does have some side-to-side motion, most of that movement is performed at the joint below the ankle called the subtalar joint. Ligaments connect bones together in the ankle. On the outside of the ankle there are three ligaments. On the inner ankle there are five. There are also four ligaments that connect the two bones of the leg together called the tibia and fibula. Ankle ligament injuries occur whenever any of these ligaments are stressed beyond its elastic limits. Outer ligament injuries occur when the foot turns down and in and the ankle rolls to the outside. These ligament injuries are the most common type of ankle ligament injuries and can occur in any sport, falling off of a high-heeled shoe or even just stepping down off of a step. When the ankle ligament turns excessively, the ligament could stretch, partially tear or completely tear. When the main ligament (ATFL-anterior talofibular ligament) tears, then the secondary outer ligament called the calcaneal fibular ligament (CFL) can stretch, partially or completely tear. Usually at that point the injury stops but in some severe cases the ligament in the back of the ankle called the posterior talofibular ligament (PTFL) tears. The degree of injury to the outer ligaments dictates what has been felt or what is seen after the injury. Mild stretch injuries will typically allow the patient to weightbear immediately after the injury. When a pop is felt, it is usually the ligament tearing and more pain is usually present. There is very often tenderness and swelling along the inside of the ankle. This occurs when the outer ligaments tear and the inside of the ankle bones hit each other (talus hits tibia) and bone contusions develop. Tears are often accompanied by diffuse and immediate swelling on the outside of the ankle. Over a day or two the outer ankle will become somewhat discolored or black and blue. Sometimes that spreads towards the inside of the ankle as well. (The greater the injury the more difficult it would be to weightbear). How are these ligaments evaluated? A thorough history and physical examination is performed by one of our doctors. The mechanism of injury is sought, as this gives us a lot of information about the degree of injury and what other structures have been affected by it. During the physical exam each ligament is palpated to assess which ligament has been stretched, partially torn or completely torn. Stressing the ankle joint gives us information about the degree of instability to the ankle region. Palpating the inside of the ankle gives us further information about the degree of injury to the outside of the ankle. The more tenderness there is on the inside, the greater the degree of injury on the outside. It is imperative to evaluate the entire lower extremity with ankle ligament injuries. Some patients have a complete predisposition to having these ligament injuries and once the treatment for the acute injury is complete, then addressing the predisposing factors becomes critical. Patient should usually have mild, moderate or diffuse swelling to the outside of the ankle depending on the degree of injury to the ligaments. Patients may be able to fully weightbear for mild injuries or be completely unable to put the foot down due to severe ligament injuries to the ankle. Swelling may develop immediately and usually occurs over the ligaments that have been injured. Swelling may extend or occur on the inside of the ankle due to a bone contusion that develops with a severe outer ankle ligament injury. Discoloration usually develops within a few days. The degree of discoloration usually coincides with the degree of injury to the ankle. X-rays are performed to rule out fractures to the ankle. Ankle ligament injuries may be associated with an injury to the joint surface of the talus called an osteochondral injury (OCL). If one is seen, then the treatment changes and we often go towards a CT scan. MRIs are not initially taken unless we suspect an osteochondral injury (OCL) that is not seen on a standard x-ray. MRIs may be necessary when we suspect subluxation of the peroneals or an injury to the tendon structures around the ankle. MRIs, although not used initially, may be used at six weeks or later if an acute ankle injury does not heal or move along the pathway of healing in the normal suspected timeframe. We also will utilize MRIs if pain is greater than what we would expect to see from the ankle ligament injury that presented to us. CT scans are rarely necessary for the ankle unless on an x-ray or an MRI an osteochondral lesion (OCL) is suspected. The CT scans allow us to grade the injury to the joint surface (OCL) and help dictate formalized treatment. CT scans give us more information about the bony architecture of the ankle and whether other ankle injuries have occurred before. Bone spurs are often seen on CT scans more clearly than an MRI or x-rays. The CT scans may be necessary when underlying arthritis is present in the ankle and we are contemplating an arthroscopic surgical procedure. There is no standard of grading for ankle ligament injuries, although doctors often grade these injuries with Grade I as a stretch injury, Grade II as a partial tear and Grade III as a complete tear. We try to generally stay away from grading injuries and evaluate each patient individually based on their prior history of injury, degree of present injury and desire to return to sports and activities. Stretch injuries to the ankle ligament injuries are usually associated with general low-grade swelling and low-grade soreness to the outer ankle. These stretch ligament injuries can be treated conservatively with an ankle brace. Ankle braces are utilized to stabilize the ankle and prevent further injury. We strongly advise all our patients to wear their ankle braces to sleep, as it will keep the foot at a 90-degree angle and prevent stress to the ankle ligament when it is trying to repair itself. Anti-inflammatories are always contraindicated. They should not be taken with acute ankle ligament injuries, as Mother Nature wants to cause some inflammation to the area. Inflammation is the precursor or the most important thing necessary for the ankle ligament injury to heal. Without inflammation we do not heal as well because inflammation gives us scar tissue to mend the ligament. In some cases patients with a stretch injury have a long history of minor ankle sprains and weakness to the muscles on the outside of the ankle. In those cases we strongly encourage a short course of physical therapy and home exercises to allow the patients to return back to sports. In women we tell them to avoid wearing heels, as this puts undue stress on the ligaments as it is attempting to heal. Sports activities should be limited in some cases for a week or more and utilizing the brace is best for 2-4 weeks until there is pain free range of motion and the examination has shown that there is complete stability and strength back to the ankle. If the foot has a posture that favors rolling out excessively (high arches), then some type of orthotic or custom bracing should be made to prevent more chronic instability from developing. Partial tears occur when the main ligament on the outside of the ankle (ATFL-anterior talofibular ligament), stretches beyond its elastic limits and partially tears. Patients will have slightly more swelling and pain when they begin to weightbear. Discoloration may develop within 24 hours. These injuries, when accompanied by difficulty weightbearing, usually require immobilization in an ankle brace and boot (Cam walker). The boot allows the patient to weightbear in most cases completely free of pain. The ankle brace gives it further stability and is necessary when the patient sleeps to keep the foot at a 90-degree angle to the leg and prevent stress at the attempted repair of the ligament. Again, in all cases anti-inflammatories should be avoided. Tearing of the ligament is a signal to the body to get inflammation. Inflammation is the most important part of healing. Taking anti-inflammatories such as Advil, Motrin, ibuprofen, Aleve, or Naprosyn would not provide the best chance of long-term healing. Immobilization may be necessary for 2-4 weeks. If the patient has had multiple injuries before, then it is more important to keep the ankle immobilized for a longer period of time to allow healing to take place. A short course of physical therapy is necessary to restore range of motion, strength and stability back to the ankle. In most cases patients can go back to participating in practice and then their sport in 3-4 weeks. Women should avoid wearing high heels for at least one month. Complete tears of the main ligament (ATFL-anterior talofibular ligament) are usually accompanied by more pain, difficulty weightbearing, swelling and discoloration to the outside of the ankle. These ligament injuries require immobilization to allow the ligament to heal primarily. In most cases a hard weightbearing cast or an ankle brace and a boot is all that is necessary. Patients can immediately weightbear as pain allows. The ankle brace should again be used in the nighttime while the patient sleeps and the boot should be used any time the patient weightbears. If it occurs on the right ankle, the boot can come off while the patient drives but the brace should remain on at all times. Immobilization may be necessary for four weeks. No anti-inflammatories should be used at any time. Physical therapy is usually begun once stability begins to take hold in the ankle and that could take 2-3 weeks. Physical therapy’s aim is to restore range of motion, strength and stability back to the ankle. Return to sports may take 4-6 weeks. These injuries are often accompanied by a mild stretch or partial tear to the secondary ligament on the outside of the ankle called the calcaneal fibular ligament (CFL). If present, similar protocol is needed. 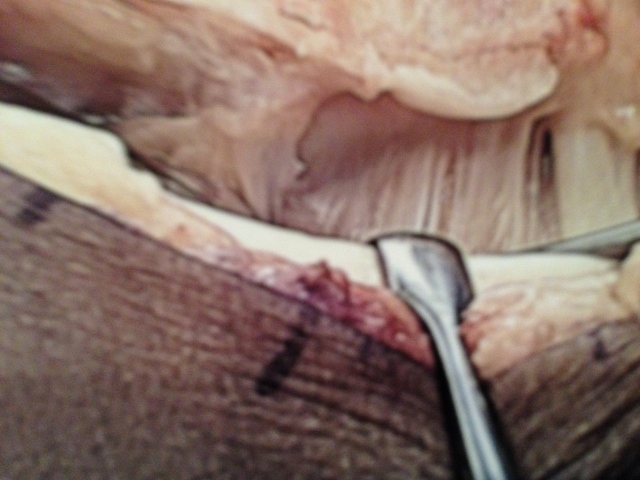 This partial ligament tear will heal in the same timeframe as the main ligament injury. 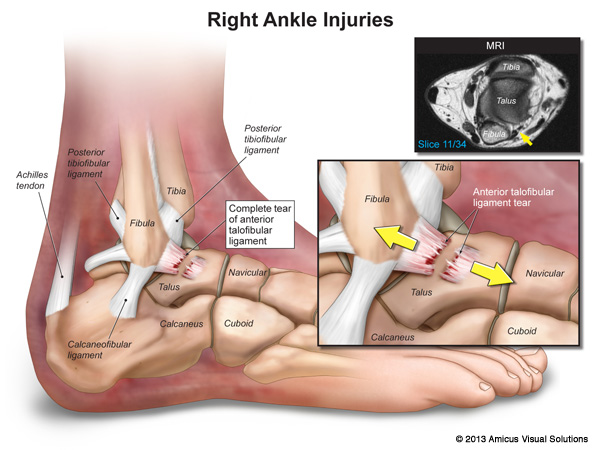 Complete ligament injury to the anterior talofibular and calcaneal fibular ligaments creates a more unstable ankle. This ankle ligament injury is often accompanied by a mild, moderate or severe bone contusion on the inside of the ankle. This bone contusion causes a lot of pain and swelling as well as pinpoint tenderness to the inner ankle joint region. These injuries always require some form of immobilization. In young athletes we prefer to get the patient in a hard cast for 2-4 weeks. While the patient is in a cast they can weightbear to tolerance. Crutches are not necessary. In some cases the bone contusions on the inside of the ankle cause more discomfort than the ankle ligament injury. This may preclude pain free weightbearing and crutches may be necessary. Following the cast removal then a boot and brace is applied. This allows further immobilization. However, physical therapy usually can begin at about 3-4 weeks. During the process, an ankle brace is necessary while the patient sleeps. This will take away stress from the ligaments while they are attempting to heal. All anti-inflammatories should be avoided for at least six weeks. A return to practice in sports may take 5-6 weeks and a return to sports may take 6-8 weeks. If this ligament injury has occurred once or twice, then conservative care usually works well to allow complete healing of the ligament injury. Surgery for complete ligament tears in a patient that sprains their ankle once or twice is typically not necessary, as these patients will heal with conservative care uneventfully with an excellent long-term outcome. It is critical to understand which ligaments have been injured. It is also important to understand the history of the injury and whether the patient is at risk for further injury due to their foot type. People that are flatfooted typically do not have as many recurrent outer ankle ligament injuries. People with high arches typically do. In people with high arches it is even more important to immobilize the area to prevent chronic instability. In people with high arches, when the ankle ligaments tear the secondary stabilizers called the peroneal tendons have to over work and they often develop a split tear, which may require surgery. It is likewise critical to never use anti-inflammatories for acute ankle ligament injuries, as this will delay the inflammatory process and limit healing. Anti-inflammatories usually can be used at 5-6 weeks if there is an abundance of swelling after the ligaments have been assessed and checked for healing. If we suspect further damage to the joint and the patient does not heal in the appropriate timeframe, we will do an MRI to further evaluate the injury and when necessary get a CT scan if an osteochondral lesion (OCL) is suspected. Chronic ankle instability can occur when the ankle ligaments have not healed and the ankle has no stability during sports, activities or in a female when she wears a high-heeled shoe. Feels like the ankle will give out when walking on any uneven surface. Patients usually have to watch where they walk for fear of stepping on a pebble or an object that causes the ankle to roll. Inner ankle gets “jammed up”. Female patients typically have to watch the height of the heel they are wearing to prevent falling when walking. Pain, low-grade swelling and tenderness are along the outer ligament complex. Tenderness along the muscle-tendon unit (peroneal tendons) as they try to stabilize the ankle. Swelling and tenderness on the inside of the ankle due to the ankle constantly rolling. Palpation of a bone spur on the inside of the ankle due to repetitive stress of the talus against the tibia. Frequent need to wear an ankle brace to get a feeling of more stability and prevent the ankle from rolling. For mild to moderate instability, conservative care usually consists of bracing an ankle during sports and activities. Contrary to many beliefs, it does not cause atrophy to the muscle. It does help support the ankle and prevent the ankle from rolling. In some cases bracing may not provide enough stability. If the foot has a tendency to roll to the outside due to the increased arch, an orthotic made for their running shoe or cleat may be invaluable to take away some of the torque and twist to the outside of the ankle. Moderate to severe cases are very common when athletes have had frequent ankle sprains and the ligaments have failed to heal. Cortisone injections will not help provide any stability but they can provide some temporary pain relief when there is inflammation in the ankle joint. Prolotherapy is something that can be performed to help increase inflammation, hopefully obtaining some scar tissue to add some stability to the ankle. These are small injections that are given weekly into the ankle ligament to hopefully create more thickening and more stability to the ligament that will hopefully provide stability. When conservative treatment fails, surgery is an excellent option. In most cases the surgery is performed after a thorough evaluation of the injury and the long history of the injuries that have occurred before. 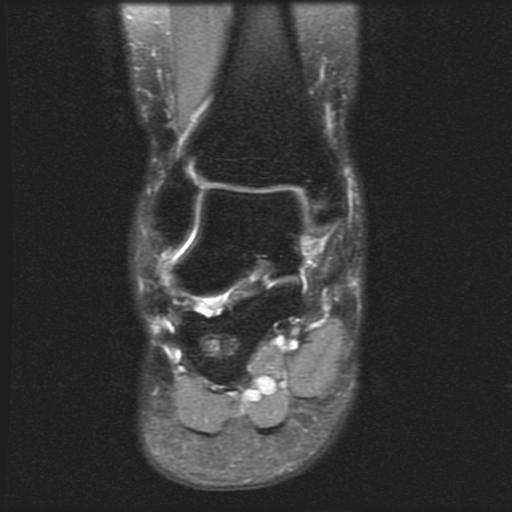 MRIs are always performed and CT scans occasionally to fully evaluate the extent of injury to the ankle. In most cases we are able to take the patient’s native ligament structures, shorten them and tie them back to the bone with small drill holes and thick sutures. The procedure most commonly performed is called a “Brostrom”. It is an outpatient procedure performed under a twilight or a general anesthetic. An incision is either placed in the front of the fibula or around the outside of the fibula and one (ATFL) or two (ATFL and CFL) ligaments are repaired. Postoperatively patients are placed in a cast and nonweightbearing for 3-4 days. Postoperatively the patient is seen at day four and placed in a weightbearing cast. They are able to weightbear to tolerance. Casting is usually necessary for six weeks. During the casting process patients are allowed to get on an exercise bike and go to the gym to perform a lot of activities. Leg extensions, leg curls, Smith machine squats and leg presses are all permissible. This is because once the foot and ankle are in a cast the surgical repair is completely protected and no further injury can occur to it. At the end of the immobilization process a 4-6 weeks course of physical therapy is necessary to help restore range of motion, strength and stability back to the ankle. Once the patient returns back to sports, an ankle brace is usually necessary for one or more months to allow them to get back to sports while minimizing the risk of reinjury. The prognosis is usually excellent when a Brostrom procedure is performed. Patients usually can return to all sports and activities without any problems. In some cases the patient’s ankle ligaments are of such poor quality that repairing them back to bone will fail. In those cases other surgical procedures may be necessary to afford long-term stability. 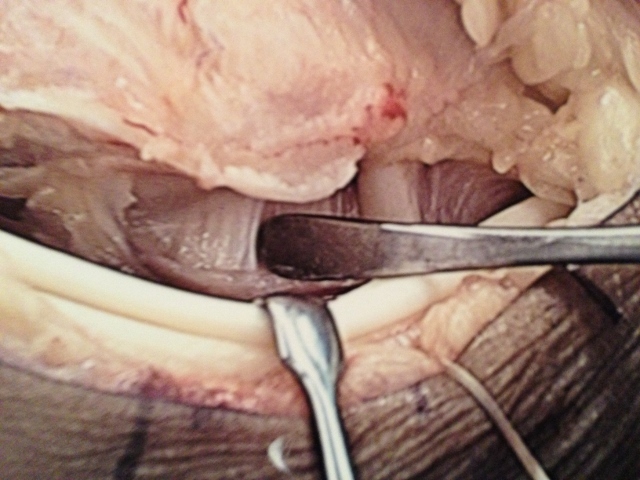 In some cases we will use an allograft (cadaver tendon) weaved through the bone to create stability. In other cases we will split one of the tendons on the outside of the ankle and weave it through the bone to provide long-term stability. 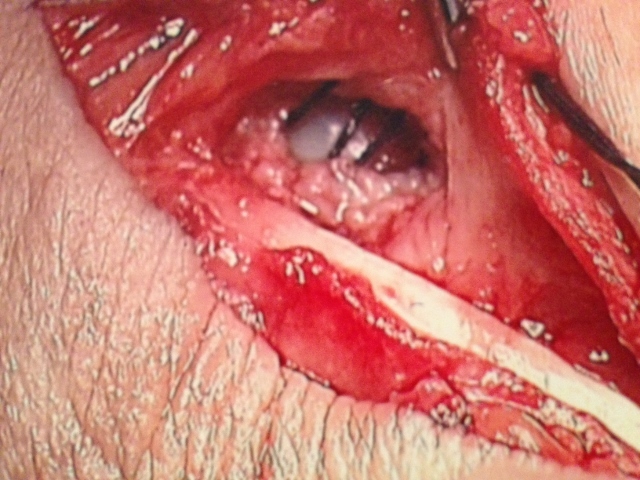 Postoperative course is similar to the Brostrom procedure. The long-term prognosis is usually excellent as well. In evaluating which patients require a particular procedure, we take everything into account, which includes foot type, history of injury, quality of native ligaments and general stability of the ankle. This evaluation helps us provide the best possible care for our patients. We are able to choose the best procedure to provide the best long-term prognosis. The deltoid injury consists of five ligaments that connect the lower leg bone (tibia) to the foot. Usually caused from a traumatic event where the ankle gets hit from the outside causing the foot to roll in. Injuries to the deltoid ligament may be partial or complete and also may be associated with fractures to the tibia or fibula. Severe flatfoot deformities cause the foot to move in a down and in position. Over time all the motion is taken up by the foot and further motion is necessary, causing the ankle to tilt, injuring the deltoid ligament (tilted ankle). Injuries to the deltoid ligament when acute cause pain with any attempted weightbearing, diffuse swelling, tenderness and often ecchymosis (discoloration). For simple injuries the patient may be able to weightbear. For severe injuries the injured person will not be able to put any weight on the foot and ankle. Extreme tenderness is present to palpate some or all of the deltoid ligaments. It is important to rule out other injuries that may have occurred at the same time. This can include injuries to the syndesmosis and/or tibia and fibula. Standing or weightbearing examination may be needed to rule out severity of a flatfoot deformity. Tilting of the ankle may be easily seen clinically. X-rays are necessary to rule out any bony injury or an increase in the space between the talus and the tibia. A tilted ankle where there is an increase in joint space in the inside of the ankle may also be seen with severe or chronic injuries to the foot and ankle. MRI may be necessary to rule out other injuries to the ankle and to fully evaluate the injury. For simple injuries; to the deltoid without associated bony injuries (fractures), immobilization in a cast or boot may be necessary. This immobilization may be necessary for 2-6 weeks. Depending on the injury, crutches may be needed during that time. Following removal of immobilization, physical therapy is started to restore range of motion, strength and stability back to the ankle. 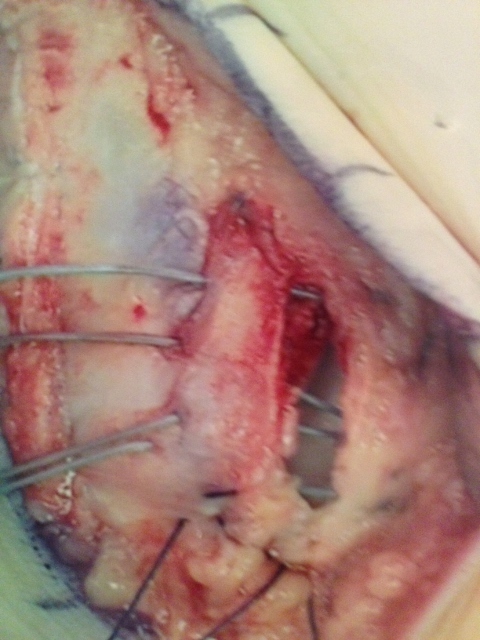 Surgery is rarely if ever necessary for isolated deltoid ligament injuries. If the deltoid ligament is isolated (not associated with any bony injuries), prognosis is excellent and patients may return to sports within 4-12 weeks, depending on the number of injuries in the deltoid ligament complex. Bracing may be needed for 3-4 months to prevent recurrence of injuries. If the deltoid ligament is associated with other bony fractures, the fractures may need to be openly reduced and fixed. During the immobilization of these injuries the deltoid ligament will heal most often primarily without any long-term issues. If severe foot deformities are present, it may be necessary to treat these deformities to prevent worsening of a tilted ankle.